Pakistan polls: Will 'sympathy' for Sharif overwhelm Army support for Imran? As Pakistan votes to decide who rules it for the next five years, Nawaz Sharif's Pakistan Muslim League-Nawaz (PML-N) and Imran Khan's Pakistan Tehreek-e-insaf (PTI) face each other in what many see as being a rigged election. Pakistan People's Party (PPP), which was a major contender till the last election, has pretty much withdrawn to the sidelines. While the military establishment seems to be secretly supporting Imran Khan and victimising PML-N and its leader, what chance does Sharif's party stand in coming back to power? PML-N likely faces a difficult task this year as many candidates, who were given tickets, abandoned the party and shifted to PTI. This last-minute shift in loyalty meant that PML-N was left with no time to nominate a new candidate and hence has almost provided a walkover win for the competing candidates in some constituencies. Some, who were not given a PTI ticket post the betrayal, have chosen to fight the election as independents and are likely to emerge as the deciding factor at the end of counting. In case of their victory, these candidates are likely to charge high prices in order to join the party that needs them. The army's high-handedness has made it difficult for other candidates who chose to stick with the PML-N. Many were threatened with arrests and some were arrested. Within hours of filing nomination as the PML-N candidate at the NA-59 Sector against former interior minister Chaudhry Nisar Ali Khan, Qamarul Islam Raja was arrested by the NAB over his alleged role in having awarded contracts for 84 water treatment plants at inflated prices. Another PML-N leader, Hanif Abbasi, was arrested and sent to jail after he was convicted by the Control of Narcotics Substances (CNS) Court of Rawalpindi and handed down a life term in a case related to misuse of the controlled chemical ephedrine. Abbasi is contesting election against Awami Muslim League (AML) chief Sheikh Rashid from NA-60, Rawalpindi. The conviction of Abbasi will give Rashid a walkover since there is no covering candidate of the PML-N in the constituency. While Nawaz Sharif's move to return to Pakistan after the conviction by the NAB to serve a 10-year prison sentence cannot be called a masterstroke, it is generally agreed to be a good move. His return to Lahore from the side of an ailing wife in London, only to be arrested and taken straight to jail, has generated sympathy not only among his followers but also among those who were till then undecided on their votes. 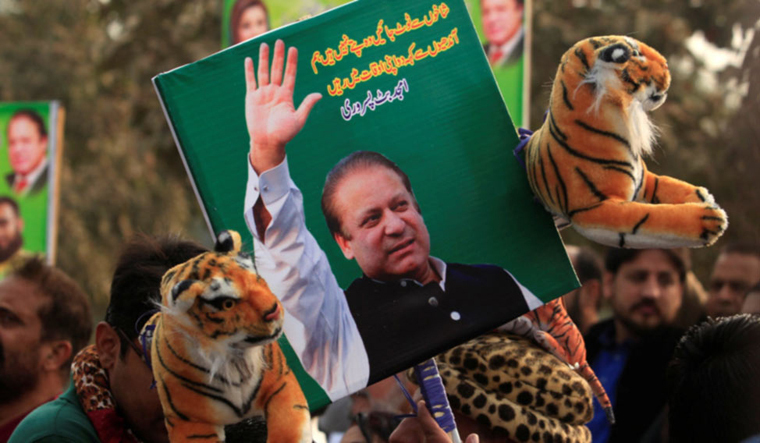 “By returning to Pakistan two weeks ago and submitting to a 10-year prison sentence on corruption charges, Sharif is hoping to rally his party’s base by casting himself as a political martyr and the PML-N’s voters as democracy’s last line of defence against power-hungry generals and a corrupt legal system,” argued Christopher McKee of PRS Group, a political and country risk rating and forecasting firm. Though a desperate move, suggesting of Nawaz Sharif's fears that his party will splinter and ultimately disintegrate if it does not win the upcoming elections—if he had chosen not to return—it would have also been interpreted as cowardice. “One possible way to keep the party united under such circumstances would be organising a protracted campaign of protests, effectively copying the strategy embraced by Khan after the 2013 elections,” says McKee. 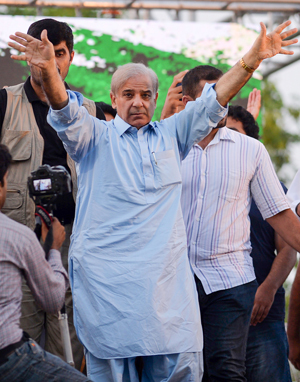 The absence of Nawaz Sharif and his daughter Maryam during election campaigning meant that his brother, Shahbaz Sharif had to lead the campaign. Though he is known for his skills in organising and administrating, he is not an effective leader like Nawaz or his daughter, whose oratory skills have been praised after their recent surrender. "Shahbaz just fails to connect with the masses the way Nawaz Sharif does. The PML-N vote is Nawaz Sharif’s vote and the lacklustre campaign being led by Shahbaz is not really helping the PML-N," Indian analyst Sushant Sareen noted in a report of the Observer Research Foundation. The party which wins Punjab, will rule Pakistan. With 141 seats, out of a total 272 in the National Assembly for which voting is held, whoever wins Punjab, gets to form the next government. The PML-N had swept to a victory in all three regions—north, central and south—of Punjab in 2013. This year, though the army managed to poke holes in PML-N's plans for south Punjab, the military establishment's' moves of political engineering in north and central Punjab has not quite worked. Polls show that PML-N still has a chance in these two regions. "The optimistic scenario in the PML-N is that it could win 60 to 65 seats in the region, perhaps even 70 because of the sympathy that has been generated on account of the perceived victimisation of Nawaz Sharif and his family by the judiciary and the military, and the intimidation of party candidates and leaders by the ‘deep state’," Sareen writes in his report. Besides, the area underwent major developmental activity under the PML-N, bolstering the local support for the party.